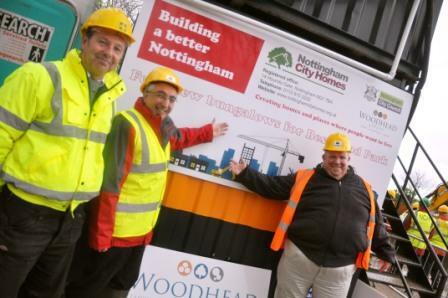 Work has just started on the biggest council homes building programme for a generation in Nottingham. The first of the projects is to build 26 new council homes, across four sites, owned by Nottingham City Council. It forms part of a much wider programme to regenerate areas of the city and build 350 new council homes by 2017. The bungalows and family homes will be managed by Nottingham City Homes (NCH) once they have been built by Nottinghamshire construction company Robert Woodhead Ltd. The cost of the project is £2.85 million, which covers preparation of the sites, development and construction costs. Windmill Close, St Ann’s – 12 family homes – starting in January 2013 subject to planning approval. In Spring 2011 Robert Woodhead Ltd was 1 of 7 contractors that secured a place on the Efficiency East Midlands New Build Developer Framework led by Nottingham City Homes. The first development on this Framework, the 26 homes, was awarded to Robert Woodhead following a mini tender competition with primary consideration being given to quality and cost. The sites will be registered to the Considerate Construction Scheme and Robert Woodhead have set a target of 32/40 under current scoring guidelines, which if achieved, will demonstrate performance beyond the national average. The construction of all 26 homes will be to Code for Sustainable Homes Level 4 with a fabric first approach being adopted. The Code for Sustainable Homes Assessment will be conducted by Woodhead Living’s in House Code Assessor which will deliver time and cost savings to the client, Nottingham City Homes. As well as Supply Chain Partners working on site employing local labour, the projects will give ten NCH apprentices the chance to work on new builds for the first time enabling them to achieve all modules required for them to achieve an NVQ level 3 in their chosen trade and site management experience. NCH Chief Executive Nick Murphy said: “This is the start of a new house building programme that will be the biggest for a generation – creating much needed family homes. The work will also help boost the local economy – for every £1 spent on construction generates a total of £2.84 in extra economic activity. City Council Leader Jon Collins said: “Building affordable homes for Nottingham people is a top priority for us and I’m delighted to see the progress on these sites across the city. The City Council has already supported the building of more than 200 affordable homes over the last two years. When it comes to choosing a reliable construction company, you can be assured that Robert Woodhead Ltd is here to stay. Established in 1946 and incorporated in 1978 we have grown steadily and now more quickly. With 69 employees and an on-going portfolio of projects, we are the partner of choice for anyone looking for a successful and proven construction company.